In loving memory of Joseph WOOLHEAD who departed this life May 2[? 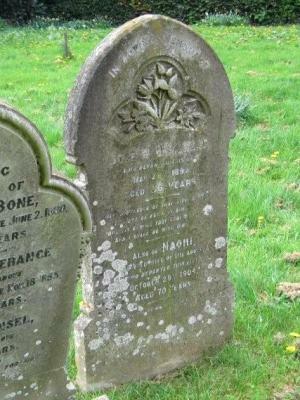 ]th 1899 aged 66 years, also of Naomi, beloved wife of the above, who departed this life October 28th 1904 aged 70 years. Neighbouring gravestone is for Naomi’s parents William and Temperance Bone.